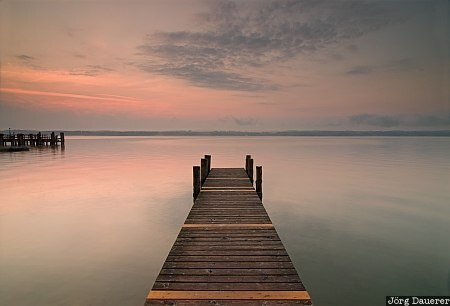 A pier reaches into Starnberger See near Tutzing with a colorful sunrise sky in the background. Tutzing is south west of Munich in the county of Oberbayern, Bavaria, Germany. This photo was taken in the morning of a sunny day in August of 2007. This photo was taken with a digital camera.